Francis Jordan’s Parents and Friends is an association made up of parents who wish to support the aspirations and endeavours of the school. Its main functions are to discuss matters pertinent to the life of the school, to raise money to provide resources and to foster a community spirit, through appropriate social activities. Parents are invited to become active members of the P & F by attending regular meetings, which are held on Wednesday once a month, commencing at 7:00 pm. Add value. We recognise that the quality of our children’s education can be positively enhanced by our actions in raising funds, undertaking improvements and supporting the school. Encourage participation. We seek to encourage as many parents and carers as possible to become involved with the school. It not only spreads the volunteer workload, it also enhances the feeling of belonging to the school community. Our children also benefit from seeing their parents involved. Support the school. While we reserve the right to have our own collective and individual viewpoints, we respect the school’s decisions and policies, and pledge to work to support the school to the best of our abilities. Be positive. We aim to work together building community through positive connections and relationships allowing improvements to be made in the school where needed. Be focused. Rather than be reactive to circumstances we seek to identify what needs to be done and the means to achieve positive outcomes. Respect each other. We recognise that all families have different circumstances and a range of capacities, over time, to support the school. There may be work or family pressures or existing commitments to other schools or community and sporting groups. We are thankful for whatever time and commitment parents can make to the school. We see parent involvement as a positive commitment rather than an obligation. Contribute to a caring school and parish community. The time our children spend at Francis Jordan is relatively brief. For our children and their families we would like to help make it among the best years of our lives. We also acknowledge we are part of a wider parish community and pledge to work with the parish on issues and projects that strengthen our broader community. liaise with the Federation and Parish to organise guest speakers for the Association members on current and suggested educational programmes, faith development and other matters of interest. Gifts are purchased by the P&F Committee. These gifts are then available for the students to purchase generally on the Thursday and Friday before the mothers’ and fathers’ day weekends. Gifts are priced approximately $5-$10. Proceeds assist the P&F and the activity helps children to develop skills in independently shopping for others. Parents are needed to coordinate the stalls and staff the stalls. There are usually two a year. There are separate discos on the same night for Pre-Primary, Year 1, Year 2 and Year 3 students (5.00-6.30) and Year 4, Year 5 and Year 6 students (6.30-8.30). Profits from the door and confectionery sales go to the P&F. The discos also serve as enjoyable social events for the children. Parents are needed to set up, serve, supervise and clean up afterwards. This is usually held in Term 3 on a Friday night from 4pm. This is the school’s major fundraising and social event. A variety of stalls and activities are presented. It is coordinated by the fundraising committee with very strong input from parents, staff and friends who volunteer to be stall and activity conveners. Classes are assigned to most stalls and activities to channel parent input for maximum effectiveness. Parent assistance is needed to assist stall and activity conveners, promotion, setting up and cleaning up. Each year the P&F conducts an Easter and Christmas Raffle. The prizes are often donated by parents or local business. Each child is given a book of tickets and asked to sell as many as possible. Support your children’s teachers. Most teachers from time to time, appreciate some extra assistance. There is a special need for parent assistance in the younger grades to help with literacy/reading programmes. Parents are needed to help with excursions, camps and other school activities. You may have a special skill such as music that can be utilised. Introduce yourself to your children’s teachers and see if there is any way you can assist. Volunteer at the canteen. The school has a full time canteen coordinator but needs volunteers to help out. You can volunteer for a day a week, a month or a term – it all helps. All training is provided. Volunteer for sports carnivals. The big events are the athletics and swimming carnivals. Parents are needed as marshals, supervisors, recorders etc. These are ‘feel-good days’ on the school calendar with an emphasis on participation. Check the newsletter for details. Help with fundraising. The P&F’s fundraising calendar includes mothers’ and fathers’ day stalls, children’s discos, Family Fun Night, raffles and a number of one-off opportunities. The school newsletter includes regular calls for assistance for these events. Volunteer for committees. The P&F committee and fundraising committees are elected at the P&F Annual General Meeting in February. There are also sub-committees and groups that manage projects and events. You can also volunteer to convene a stall or activity at the Family Fun Night. Working bees. Each family is asked to attend at least one working bee during the course of the year as they arise. A wide range of jobs is available, both inside and out. The working bees generally finish with a social drink or morning tea to encourage greater family interaction. Notification of working bees will be via the school newsletter. 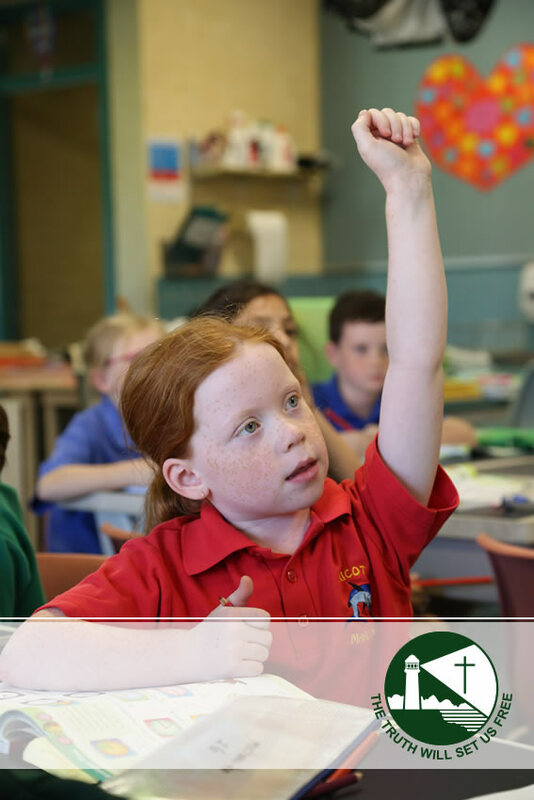 As a school community founded on relationships which are based on shared beliefs and common goals, there is an expectation that all parents, volunteers and visitors to the school comply with the Catholic Education Code of Conduct for Parents and Volunteers.